Make happy memories this summer at Pine Crest! Join us at Pine Crest Summer from Monday, June 10 to Friday, August 9, 2019. Browse our summer camp programs. Interested in working for Pine Crest Summer? Click here for summer employment details and the application link. Campus Tours are available Tuesday and Fridays from 10:00 to 10:45 am. Please call the Pine Crest Summer Office at 561-852-2823 in Boca Raton or at 954-492-4137 in Fort Lauderdale if you would like to schedule a tour. Pine Crest will offer a 5% discount on camp when a parent registers one child for four or more weeks, and Pine Crest will offer a 10% discount on camp when a parent registers one child for a total of eight weeks. Registration and payment must be complete by Wednesday, May 1, 2019. Why do parents choose Pine Crest Summer? Join in the fun this summer to exercise your body and mind, try something every week at summer camp, and make new friends. Join us for one week or the entire summer. Select one program for the summer or try something new each week. All programs are led by Pine Crest faculty and staff on Pine Crest’s secure Boca Raton and Fort Lauderdale campuses. Pine Crest Summer allow families the flexibility to fit camp into their summer plans, join us for one week or the entire summer. All summer program offerings are subject to availability and sufficient enrollment. Download the summer program brochure to start customizing your summer by campus, grade, and week. For 61 years, campers have made memories and friends at Pine Crest Summer. Campers can customize each week of their summer and try one-of-a-kind programs designed by Pine Crest School faculty and staff. For 61 fantastic summers, campers and counselors have joined together in a fun and supportive spirit, making summer memories worth reminiscing for years to come. As a traditional summer day camp with activities inside and outside, campers enjoy the campus and the original signature camp at Pine Crest School. Through games, art, and hands-on activities, students will learn how specific animals get their food, how they protect themselves from predators, how they interact with their environment, and how humans can help conserve them. Campers will learn about insects, reptiles, mammals, birds, and amphibians though fun and surprising facts about specific animals. Included in this program will be a wildlife center field trip depending on the weekly animal focus. Campers will learn using Pine Crest School's new Anatomage Table. Learn how to paint, print, dye, embellish, and sew. Possibilities are endless when working with fabric. Just bring your creativity! Through hands-on, experiential learning, participants will investigate topics such as crime scene investigation, evidence recovery and handling, and analysis of fingerprints, forensic DNA, bloodstain patterns, trace evidence, and footwear impressions. Through these investigations, students will use critical thinking skills, advanced technology, and data analysis to examine and interpret the evidence from a mock crime scene. Campers will learn basic food skills in a fun and safe environment under the instruction of Chef Nick in Boca Raton and Chef Andy in Fort Lauderdale! Campers will work together measuring, chopping, and stirring to create delicious and healthy recipes. The week will culminate with a catered luncheon for parents created by the campers. Afternoons will include pool and other cooking activities. We’ve got spirit, yes we do! We’ve got spirit, now you will too! Campers will learn cheers, chants, and a routine which they’ll perform at the end of the week. Campers will also create cool crafts to show their support of others. Continue building academic skills throughout the summer in an immersive learning environment. Learn and grow your knowledge this summer with Pine Crest faculty members. Pine Crest School offers currently enrolled students an opportunity to complete required courses, study a new topic, or enrich knowledge in a particular subject in advance of the next academic year. All courses are taught by Pine Crest School faculty and take place in the Upper School on the Fort Lauderdale campus. Dates: August 5-9 from 9:00 a.m. -12:00 p.m.
Students will brush off summer cobwebs and review essential strategies that lead to success! Topics covered include such Middle School executive skill expectations as time management, organizational skills, study aids and strategies, planner usage, how to navigate eLearning and Backpack, and goal setting. Additionally, students will apply critical thinking, close reading, and annotation skills to short stories, review their summer math packets, and practice document-based analysis in preparation for the upcoming school year. Begin the school year READY! Science, technology, engineering, and math (STEM) Camp is the perfect setting for your camper who loves to design, code, build, and create. 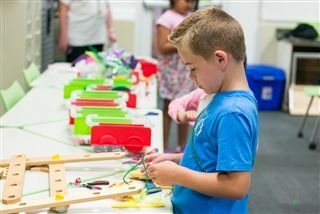 Campers will have the opportunity to make, tinker, innovate, and solve real-world problems in our state-of-the-art iLabs. Art camps combine age-appropriate activities in art, band, dance, music technology, strings, and voice. Explore and enhance your talents in an experiential learning environment with Pine Crest faculty and staff. Campers also have the opportunity to add private music lessons. Whether you are just starting or have been playing an instrument for years, Pine Crest Band Camp is tailored to your interests and needs. Explore jazz improvisation, work on All-State material, prepare a solo or an ensemble, record yourself using our state-of-the-art recording equipment, or simply enjoy the excitement of becoming an outstanding musician! Taught and choreographed by experienced Pine Crest dance faculty, dancers have fun improving their dance skills. Various dance styles will be included with Sports Performance to maintain proper conditioning on the Fort Lauderdale campus. Campers explore the pre-production, production, and post-production phases of digital media. Students create music videos, short films, and news stories with state-of-the-art, high-definition (HD) video editing software. Join Pine Crest Fine Arts teachers as we put on a show! Each week at Fine Arts Camp, we will explore art projects, set development, movement, choreography, music making, stage direction, singing, acting, and so much more! Pine Crest sports camps offer campers entering grades kindergarten through twelve opportunities to learn or improve in a specific sport, participate in general sports, or train for advanced competition. Pine Crest athletic trainers have incorporated strength and conditioning to develop a personalized, developmentally-appropriate training regimen for every sport and age group. Using Pine Crest School’s batting cages and fields, baseball players will have opportunities to work on arm strength, pitching, field position development, and hitting mechanics to help improve their swing. Swimming and Sports Performance will be included. Basketball players in grades four through nine will receive coaching on foundational skills including defense, dribbling and handling, footwork, layup shots, and shooting form. Players will refine basketball skills on the same courts as Pine Crest alumnus Brandon Knight ‘10 during scrimmages and three on three, full court, half court, and knock out games. Lacrosse campers will receive personalized instruction on fundamental stick skills including catching, cradling, scooping, shooting and throwing while participating in drills and scrimmages. Swimming and Sports Performance will be included. Summer is a great opportunity to try rowing for the first time in a no-pressure, fun, and safe space. For the more seasoned rower, summer is a great time to gain more practical training and technique in preparation for the upcoming fall season. We encourage rising freshmen who are interested in joining crew in the fall to attend camp to prepare for the upcoming season. The Pine Crest coaching staff will train the student-athletes on boat handling skills, the basic rowing stroke, and teamwork. Swimming and Sports Performance will be included. Pine Crest's Summer Swim Camp is dedicated to teaching campers the basics of all four strokes, survival techniques, and water safety. This program may be combined with a morning of Elevate. Pine Crest’s Rising Stars summer swim camp is dedicated to teaching campers the basics of all four strokes, survival techniques, and water safety. The camp day includes swim and dive sessions, games, and activities in and out of the pool. Swimmers will be instructed in all aspects of competitive swimming with a focus on technique in all four strokes, dives, turns, and underwaters as well as a race strategy, nutrition, and mental preparation. All campers will be filmed underwater and analyzed to improve their technique. A typical day includes two swim sessions, one dryland session, and one classroom session. 1-8 Tennis is a full day program or it can be paired with Elevate mornings. Tennis Camp emphasizes learning the sport of tennis in a fun, engaging manner with a focus on gameplay mixed with instruction and tennis fundamentals. Our tennis program is led by Pine Crest's United States Professional Tennis Association (USPTA) Certified Tennis Professionals. With a focus on gameplay mixed with instruction, campers learn tennis fundamentals, including conditioning, footwork, physical fitness, and strokes. Volleyball camp introduces campers to the basic skills, proper mechanics, and fundamentals of volleyball. Skills such as passing, setting, serving, hitting, and defense will be taught through drills, exercises, and scrimmages. Emphasis is placed on building a strong foundation to improve overall skill level and performance while having summer fun. Pool and Sports Performance will be included. Add bus transportation or an extended day program to help Pine Crest Summer fit your schedule. Campers may be dropped off early and picked up late with Pine Crest summer staff supervision. A snack will be provided at afternoon extended day. Extended Day helps parents who need to drop off early or pick up late. Our Extended Day is staffed by trained counselors and is a safe, fun environment where your child will enjoy time rotating between our arcade, playground, and creative play spaces. Morning hours are 7:30 to 9:30 a.m. and afternoon hours are 3:30 to 6:00 p.m. The English as a Second Language (ESOL) is an after-camp program designed to give international campers the opportunity to enrich their understanding of the English language in phonics, spelling, vocabulary, and comprehension. Pine Crest Learning Specialists conduct a diagnostic assessment and instruct an engaging, personalized, and digital program for each camper. Part of each class will be online instruction, and the second part will be educational games and other activities encouraging language immersion. Work out in the Brandon Knight Sports Performance Center! Students in grades four through nine will work with Pine Crest trainers to develop a personalized training regimen. Campers will learn to use various age-appropriate equipment and develop techniques needed to keep safe, healthy, and ready for athletics. To maximize your results, take advantage of this opportunity by signing up for multiple weeks! Morning hours are 7:30 to 9:30 a.m. and afternoon hours are 3:30 to 5:30 p.m. Call or email to book your swim lesson. Pine Crest Fort Lauderdale campus offers optional bus service throughout most of Broward County, select stops in North Miami/Aventura, and South Boca Raton. Note: Children must be five years old to ride the bus. Registration opens January 25, 2019, click to view registration steps. The Health Office at Pine Crest School is staffed all summer with registered nurses. Sign up for updates about Pine Crest Summer Camp.